Great day for all our followers, and nothing better than starting the day with a crochet pattern is not really. The crochet is always renewing every day and with this we have to update ourselves also with the trends and news in the world of crafts and in our case more specific crochet world. The love of craftsmanship often comes from the encouragement of family or grandmother or mother. It can happen more is difficult to know, to know and to have the will to learn and practice of their own volition. In short, the crochet as well as the patchwork or other crafts, it is necessary that is always training, obtaining more skill with the hands and experience for new patterns. 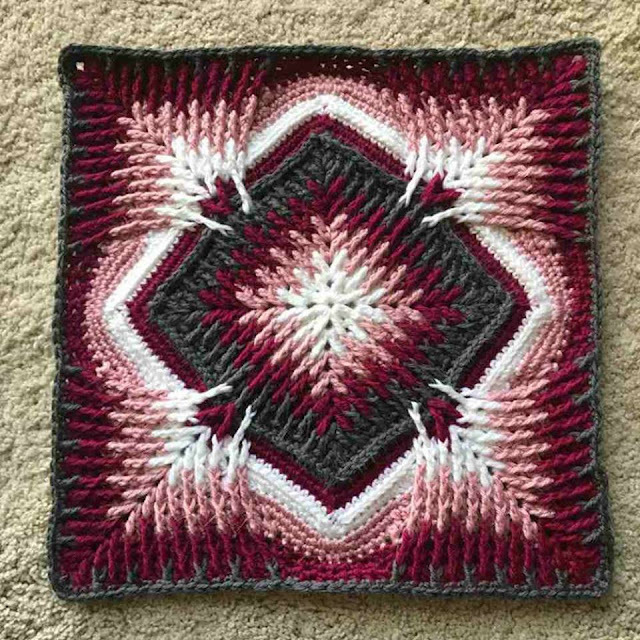 If you like crocheting then I'm sure you love doing squares too. Pattern squares are one of the first things we learn as well as how to make the main points, of course. But after the points we always start making squares of flowers or Grandma's famous square. So if you are in the beginner level do not worry because this pattern is complex, nothing that dedication does not help. Today we are going to learn a beautiful square of crochet called "Elements CAL". So, I hope you're excited for yet another incredible new pattern available here for all of you to learn more and improve your skills. It was love at first sight in crochet because through it we can do several other things like blankets, blanket for sofa, table path, rugs, you can use in another pattern too or where you think it looks better and more beautiful. It is a very exotic and creative pattern. It can make a combination of different colors, it can be a single color but I think it's more beautiful two or three colors, even if putting one tone on the other gets very beautiful, the result is perfect because of the wires from above, highlight. It is fabulous to use on blankets or rugs, the result is amazing. Enjoy and make Christmas for someone dear, they will love. Christmas coming enjoy this pattern because it is beautiful the result. One tip if you do it for Christmas is to use the colors red, green and white, it will look beautiful, or if you want only two colors you can use red and green. I hope you like it the way I liked it and I already have several projects in my head. At the end I leave two tutorial videos to help you and guide you in how to make this CAL. I'm sure you'll make a beautiful project. Do not forget to follow us on facebook, short our Xell Crafts page, there we are always sharing incredible patterns of all levels, from beginner to advanced standards, do not miss. Good job.